With spring and summer on the way, now is the time to check your equipment and irrigation schedules are up to scratch. Poorly operating irrigation systems cost time and water efficiency, not to mention the additional cost to production. You need to make sure your irrigation systems are operating as efficiently as possible to make the best of water resources. Here are some simple checks you can do to ensure everything is ready to go once conditions dry out. These are often overlooked. They are generally affected by the wearing of pump impellers over time. Checking that your flow and pressures are within 10% of operating design is critical to application efficiency. Water not irrigating the right place is water wasted. This also applies to end gun settings and broken sprinklers. This lets you know how much water you’re applying and how even your application is. Knowing how much water you’re applying is critical for irrigation scheduling. Improving the uniformity of application will result in more of your irrigation being beneficially used. Invest in soil moisture monitoring and weather forecasts: An efficient irrigation system is only as good as the scheduling of the irrigation. Knowing when to irrigate and how much to apply will save both time (irrigation days throughout the season) and money (pumping costs per day). Linking soil moisture monitoring with weather forecasts will allow any rainfall during the irrigation season to be taken advantage of. With the experience of a few tough seasons behind us, now is the time to look at your seasonal plan. Does your consent have adaptive management conditions? How would this affect your irrigation scheduling? Identify your higher production areas and your lower productions areas. Does your system have the capability to isolate areas of lower performance if the season gets tight? If you have any new staff on-board, you need to provide training, so they understand how to correctly schedule and operate irrigation equipment to ensure you optimise water use and avoid damage to expensive equipment. IrrigationNZ has a range of Irrigation Operator and Manager training days running this spring. Visit irrigationnz.co.nz/events for more details. This spring, IrrigationNZ is inviting applications for its ‘Innovation in Irrigation Award’ sponsored by Southern Wide Real Estate. Nominations are encouraged for new products, technologies, or practices that exemplify innovation in irrigation. The entry process for this highly prestigious award, with a $2500 cash prize, is simple. 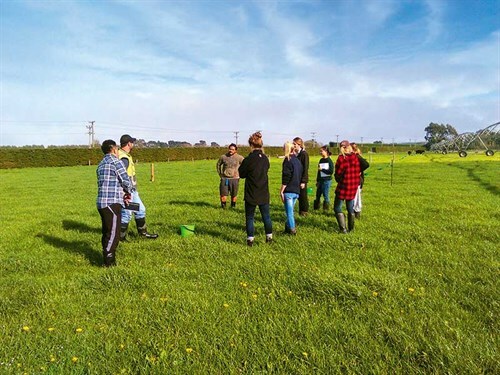 Previous finalists and winners have benefitted from the exposure and profiling that follows, so IrrigationNZ wants more innovative individuals and businesses to experience these opportunities. Entries for the award are open until the end of October. To find out more about making an application, e-mail admin@irrigationnz.co.nz.